Do you adjust your financial plans to consider inflation and varying returns? There are numerous modes of investing money. A well-known and traditional method followed by risk-averse investors is to invest in a Fixed Deposit (FD). There are numerous modes of investing money. 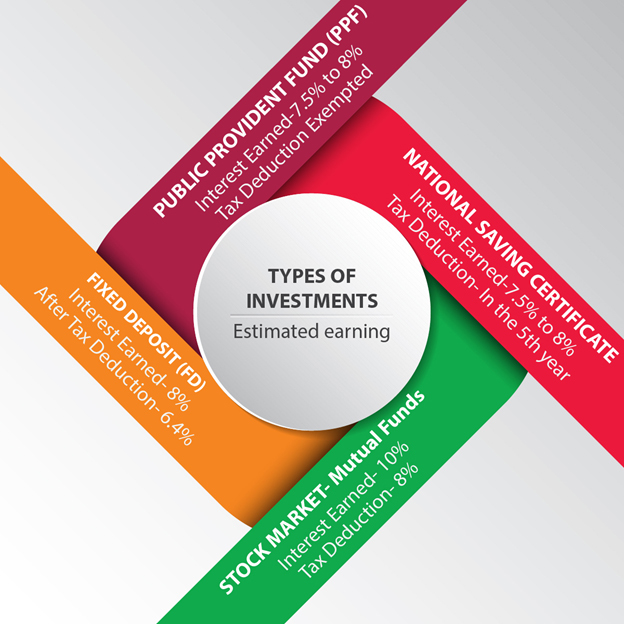 One of the well-known and traditional methods that risk-averse investors follow is to invest in a fixed deposit (FD). FDs earn an interest of 8%, which comes down to 6.4% after tax. The cost of living, meanwhile, is accelerating at a pace of 10% without any adjustments. By the logic. investing in an FD is as good as saving money to buy an iPhone 6 in the time of iPhone 7! It is high time for people to change their investment strategies and find alternative modes of investment. For a salaried person, it is very important to identify the best, tax-beneficial investment plan to save one’s hard-earned money from being paid to the government. There are always ways to bend the law without breaking it! Two modes of preferred investment would be in the Public Provident Fund (PPF) or the National Savings Certificate (NSC) deposits in the post office. Interest earned on PPF is tax exempt. Hence, you would still be earning approximately 7.5%-8% in interest, while for NSCs interest is taxable only in the fifth year. For people who want to buy a house, it is advised that the loan is taken is your name so that maximum tax exemption of interest on a home loan of Rs1,50,000 can be availed. Earning money is only one side of the coin while the other side is to create wealth from it. Investing in the stock market with a risk appetite can help you create wealth for the future. There are two methods of investing: either through a mutual fund or directly on your own. Various instruments can be purchased in the stock market. Some of them, like debentures or preference shares, give you fixed returns. Secured debentures from reputed companies can help you earn an interest of ~10%, which after tax adjustments is narrowed down to ~8%. The Economic Times, each week, publishes an article on “Top 10 Mutual Funds”. Such articles can help rookie investors to identify a mutual fund to invest in and reap maximum benefits. Since India is a growing economy, it is advised to invest in growth mutual funds so that the money is reinvested on its own rather than receiving dividends. For those who want to invest directly, it is advised that they choose the right company, preferably a company with a steady track of declaring dividends, a company which is growing in comparison to its revenue, profits after tax (PAT), Earnings Per Share (EPS), etc. It is recommended to make two portfolios: one for investments that would reap benefits in the long-term and the other one for sale as soon it reaches a pre-decided price. There would be situations where the entire stock market is in the red, do not sell at that time and wait for everything to settle down. Bad days do not last long!